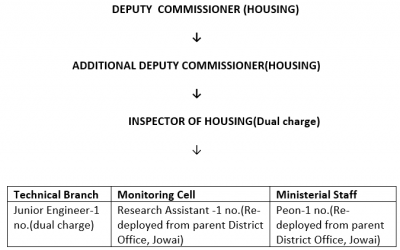 The objective of the Deputy Commissioner (Housing) Office is to implement the various Housing Schemes which is being introduced by the Government of Meghalaya since 1975 onwards. For that purpose, the Directorate drafted Rules, Bye-laws etc relating to these schemes and evolve suitable designs, specifications and estimates of different types of houses and executed them. Since 1989-1990 the loans are being advanced to private individual for the purpose of construction of the residential houses under different loan schemes by the Meghalaya State Housing Board with loan taken from financial institutions like HUDCO etc .But from 2000 onwards due to poor recovery of all loan schemes, provision of loan is being kept in abeyance by the Government. The Mission/Vision of the Department is to make available shelters to those in need of the same more importantly provide for qualitative up-gradation of the houses so that they are more durable and cheaper in the long run. The number of families without any shelter in the district may not be high,but a large majority of the existing houses especially in the rural areas are temporarily made of bamboo and thatch roofing and low grade CGI sheets roofing which need periodical replacement. In achieving this objective, trust is on the provision of all necessary facilities to the economically weaker section and the low income group particularly in the rural areas.The Department is responsible for improvement of existing residential houses in the rural areas by providing the rural poor with outright grant of roofing materials in the form of 3(three) bundles of C.G.I. sheets to each beneficiary. Provision of durable roofing material (Aluminium sheet) to the Economically Weaker Section Households(EWS) whose annual income is upto ₹.1 lakh consisting of 3(three) bundles of aluminium sheet of 8 feet in length. Provision of dwelling houses to Lower Income Group (LIG) Household whose annual income ranges between ₹.100001/- upto ₹.200000/-.This Scheme will be implemented with a cost sharing Credit Linked Subsidy where financial assistance will be limited to ₹.75,000/- and ₹.23,000/- will be borne by the beneficiaries and ₹.1,32,000/- will be sourced from bank loan and other Schemes and the cost of the house should be ₹.2,30,000/-with a plinth area of 19.20 sq mtr. The Scheme is implemented in both rural and urban areas.In rural areas, the Scheme is implemented by the Block Development offices of Community & Rural Development Office in association with the Block Level Housing Selection & Monitoring Committee(BLHSMC) which is constituted by the Government.In urban areas,the Scheme is implemented by the District Housing Office in association with the Urban Level Housing Selection & Monitoring Committee(ULHSMC) which is constituted by the Government. The selected beneficiaries in rural areas will collect the roofing materials from the Block Office,and in the case of Urban areas the materials will be collected from the go-down of the District Housing Office. Since the target is fixed by the Director of Housing based on the Budget Allotment of each year,hence the target for Wapung for the year 2017-2018 is 517 families and that of Saipung Block is 467 families for the same year.